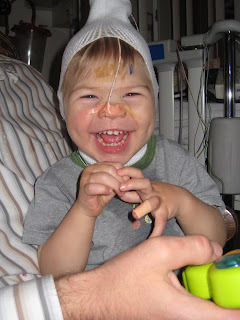 Our son is an awesome little trooper! He did so well yesterday and last night for his Polysonogram (Sleep Study) and Esophageal Reflux Study. I have to say, you all must have prayed hard for us. Elijah handled the whole ordeal like a brave little boy and was such a sweetheart. Granted, it wasn't fun (that's probably an understatement). We are definitely glad it's over. To start the day, the diagnostic technicians put a reflux sensor through little man's nose into his esophagus (that's what you see taped to his nose in the pictures). 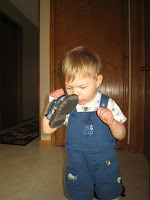 Elijah didn't like it (that's probably an understatement). He didn't like being held down, nor could he understand why I wouldn't let him down from my lap afterwards. He fussed...a lot (that's probably an understatement). Eventually, the little guy resigned himself to the fact that he wasn't going to be able to get down from my lap. We spent all afternoon and evening in a rocking chair playing with toys. What a trooper! I was glad that we were allowed visitors (something we didn't know until the last minute). Aunt Karen dropped by for a couple hours and daddy came after work. All in all, the day went by pretty fast. Then came time to sleep. Ahh...sweet sleep. Right before bed, they attached a whole bunch more tubes and sensors. Um, we didn't get very much sleep (that might be an understatement). Elijah, who has been sleeping through the night in his own crib more often than not, was up about 50 times (okay, that might be an exaggeration). In the middle of the night, they pulled a bed into our room so that Elijah could sleep with me because he was so restless. That helped, but neither of us got much sleep. Poor guy. I was having a hard time sleeping. I can only imagine trying to sleep with all that stuff taped to me. BREAKING NEWS! YAY!!!!! I got a call from the sleep doc as I was writing this (we weren't expecting news for a couple of weeks). There is good news and bad news...The good news? 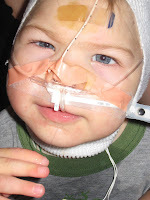 Elijah doesn't have sleep apnea! Woohoo. Happy dance time! The bad news? Elijah has pretty severe reflux...which, honestly isn't that big of a surprise. 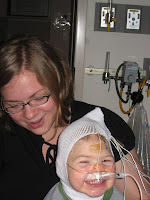 The great thing is that his reflux isn't causing apnea, which is what worried us. So, there you have it. A test summary and results all at once. This is really, really good news. Now we just need to figure out what to do about his reflux. We'll be waiting for a report from the GI doctor. Even with all that stuff attached, our little dude managed to give us a cheesy smile. What a sweetheart our boy is! Who can resist that cute little face? I am so not looking forward to tomorrow. 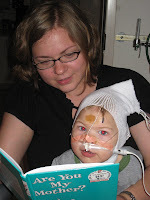 Tomorrow morning (the 29th), at 11 am, Elijah's sleep study starts. Yes, his sleep study starts in the morning. That's because he's having a Polysonogram Study AND a Esophageal Reflux Study. Sounds fun, doesn't it? 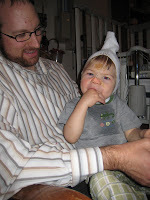 To start off the day, Elijah's going to have a tube (sensor) placed into his esophagus through his nose. I am feeling sad about this already. He's not going to like it (um, neither would I!) and I'm not going to like watching it either. I just finished packing Elijah's and my overnight bag for the hospital. It's a weird sensation packing for a night at the hospital. 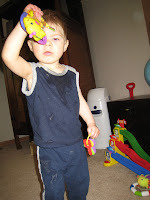 I wish I was packing for a fun excursion - like a water park...Elijah would like that. The overnight excursion we are going on...I'm pretty sure Elijah isn't going to like it. But, of course, I'm aching for some answers to his sleep issues. We need to get this resolved and so I'm anxious to get this study over with. There's a lot of reasons that I dread this experience. The memories it stirs up is certainly one reason; I'm not exactly looking forward to seeing our little man attached to a whole bunch of wires, which will definitely remind me of darker NICU days. But, the thing that makes me the most nervous is the fact that Elijah won't be able to move very much. 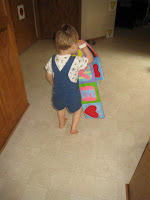 This little man loves to walk and he loves movement. If he's not walking, he'd like to be in a swing or in a stroller. 18 hours of watching movies, reading books, playing with toys (and hopefully sleeping) while sitting in a crib is not Elijah's idea of fun. Really, though, what (almost) two year old would find staying in bed all day fun? Add that to Elijah's visual issues and his fine motor delays and it seems kind of like torture. And mommy? She's not going to be able to save him. And that's going to see like torture too. We covet your prayers for tomorrow. Keep us in your thoughts and prayers, because I'm pretty sure the only way we'll get through the next day and night is if God grants Elijah a calm spirit (and me too!). We've been having a lot of fun in Elijahland lately, which is the main reason for the lack of updates lately. I wanted to share some highlights from the month of July: The Fourth, our Fifth Anniversary, our week camping and a trip to meet Elijah's new cousin, Eden. 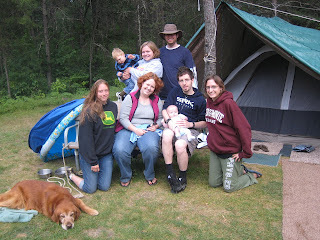 The photo is from our first day camping, which was also the day Elijah turned 23 months old. 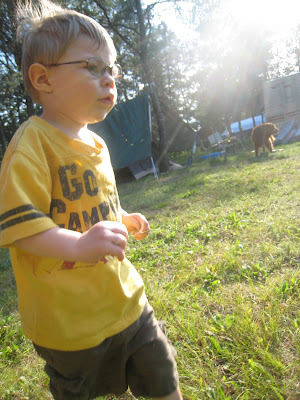 The photo is indicative of our boy these days - always moving. 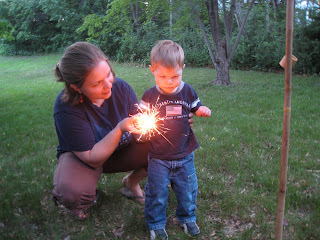 We had a fun Independence Day, celebrating with sparklers and a campfire in our backyard. 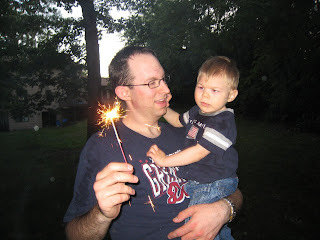 Elijah wasn't so sure about the sparklers. 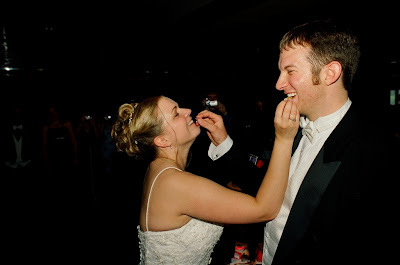 July 11th was our fifth anniversary (hard to believe it's been that long)! To celebrate, we spent our first weekend away from the little dude (Elijah hung out with Grandpa Dennis and Grandma Kathy). 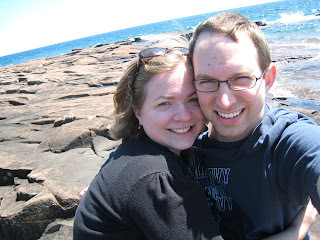 It was really good for us to get away and reflect on the last five years. We stayed at a bed and breakfast (a first for us! 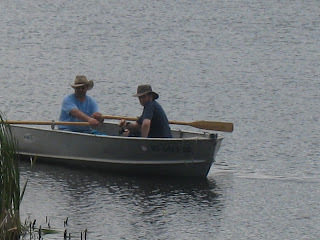 ), pretended we were kids again, and talked about Elijah - a lot. Mostly, though, we just relaxed and got some much needed sleep. After our weekend away, we packed up for a week of camping with family. We all had a blast. 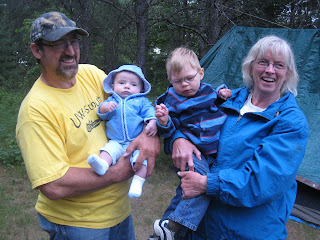 Elijah, Grandpa John, Grandma Teri, and cousin Henry. 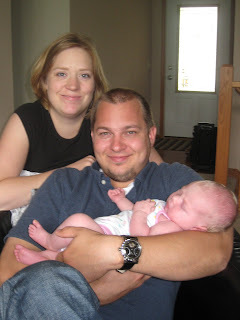 Elijah, his parents (that's be us! ), aunties, uncle, and cousin Henry. 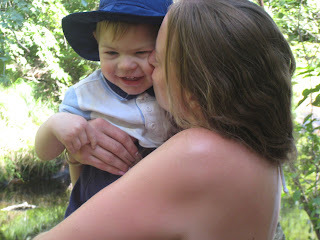 It is possible that Elijah got lots of love and kisses. Andy, me, Elijah and cousin Eden. She's so cute! (Oh, and excuse my cheesy grin. Thanks). We've been busy lately and having a lot of fun. I think we might stay home for awhile, though. 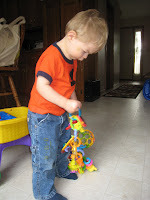 When Elijah accomplishes something new, my first thought is overwhelming joy. My second thought is usually full of fear and grief. 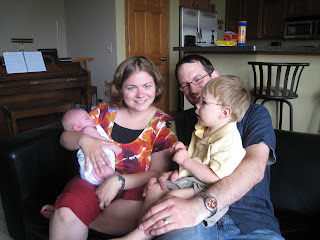 When Elijah crawled, I was on cloud nine for about a week…and then I started to wonder if he'd ever be able to walk. Elijah's first steps were so amazing. I was beyond thrilled. I knew how miraculous his steps were. My second thought was, "Will he ever learn how to read?" It's kind of irrational, isn't it? 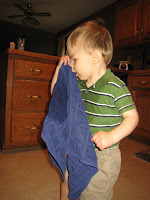 Recently, Elijah learned how to play peek-a-boo with a wash cloth. It's so incredibly cute and so exciting to see him interacting with us in this way (I hope to post a video of it soon). But, my second thought was, "A six month old can do this." I'm actually ashamed to admit these second thoughts, but I think it's important to share. The highs and lows of parenting a child with special needs are intense. When you don't know what your child will be able to accomplish, each and every obstacle they overcome is thrilling and amazing. 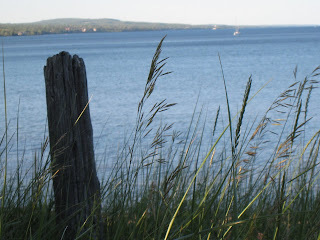 But, there is also a deep sadness – a grief over what they should be doing. We, of course, love and accept Elijah for who he is. But, like all parents, we will continue to push him to be his best self. I hope someday my second thoughts won't be thoughts of fear over the abyss that lies ahead, but instead – something like, "Hmm, I wonder what I'm going to make for dinner." I hope at some point I can embrace my joy without having it wrapped up in grief. Somehow, I'm not sure if that is possible. But, then again, my second thought is that anything is possible. Aqua Man sounds kind of like a superhero, doesn't he? Shhh, don't tell anyone. We don't want everyone to know of Elijah's other idenity do we? I know his secret is safe with all of you, right? (I'm totally comic book illiterate, so if there really is an Aqua Man, feel free to enlighten me). In totally unrelated news to Aqua Man (wink wink), Elijah really loves the water. Andy had the day off work for the holiday, so we decided to head to the park. Last year, we tried swimming lessons. 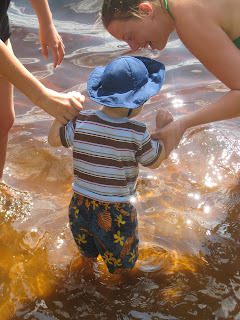 Elijah was all smiles before getting in the water, but screamed once lessons began. He screamed so much that he put himself to sleep. Poor fellow. We decided enough was enough and after a couple of sessions of screaming, decided to never come back for the rest of his lessons. ...after a few moments he decided he wanted to go deeper. Turns out that he really likes the water and the beach. I got a bit wet. I was totally unprepared for an Aqua Man and hadn't brought a suit for myself or even a towel (we dried off with a blanket). He had so much fun. It was an absolute joy to watch. 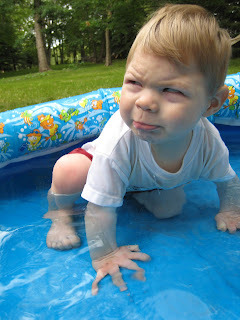 When we got home, we decided to see if Elijah wanted to play in his swimming pool for the first time. The water was cold, so we didn't think he'd want to get in. Turns out, he did want to get in and had a blast splashing in his pool. He cried when he had to come inside. Then, it was bath time to get clean and warm. And off to bed. Enough water for our Aqua Man -(er, I mean Elijah) today? I think so. Elijah's favorite toy at the moment is a piano that was given to us by our friend Barbara. It's so fun to watch him pound on the keys - and it's helpful in that I know where he is when he's playing (and can therefore get some things done). The video is a bit on the long side - what can I say? - I couldn't edit out much of our little man's recital. Plus, there's a moment where I tell him to do something and I know he understands me. It's a reminder that he probably understands more than we give him credit for.